True story: I am an Ohio State Alumni, ex-two-sport Ohio State Athlete … and an obsessive Buckeye Football fan. And if you know anything about Ohio State, know this: We Don’t Give A Damn For The Whole State Of M*CH*GAN. One such brewery is Bell’s. Bell’s Brewery is the oldest craft-brewer east of Boulder, Colorado. Formerly known as Kalamazoo Brewing Company, Bell’s Brewery Inc. was founded by Larry Bell in 1983. Larry initially opened a home-brewing supply shop, which became a brewery by default. Its first beer was sold in 1985. Bell’s story is very similar to that of many craft breweries – small production in a small facility with very little equipment. In the beginning, Larry Bell brewed his beers in a 15-gallon soup kettle, producing only 135 barrels a year. The tiny operation originally took place in a former plumbing supply warehouse. During the first four years, the Bell’s crew brewed, bottled and delivered all of the company’s beer to market themselves. Things have definitely changed since then. Now Bell’s Brewery Inc. has over twenty years of brewing experience, the ability to produce over 90, 000 barrels of beer a year, owns a 60,000 square feet brewing facility with 24 acres … as well as makes some of The Wench’s all-time favorite beers. On June 11, 1993, Bell’s Brewery, Inc. became the first Michigan brewery to serve beer by the glass to the public. Bell’s The Eccentric Cafe offers small batch brews that are not distributed outside of the pub as well as interesting food, an extensive collection of art and ephemera, and live music. I regret never visiting The Eccentric Cafe while I lived in Ohio (something in my blood would not let me cross the border). Depending on how long you have been following my blog and whether or not you know me in person … you may or may not know that I love hops. I love love love love love hops. My palate loves bitter flavors. I am a fan of super tanic red wines, dark dark chocolate, espresso, black coffee … etc. The Wench loves American craft IPAs. And I love love love Double IPAs. One of my favoriteDouble IPAs is Bell’s Hopslam. Coming in around 10% ABV, one should never underestimate the power of Bell’s Hopslam. Unfortunately for its enthusiasts, Hopslam is a limited release ale – only released in January and February. In the past, Bell’s Hopslam has been hard to find … but as the brewery has become more successful and popular – I have seen a tremendous increase in Hopslam availability. Carbonation: Normal. Decent head, lacing lingers till the end. Aroma: Mmmm hops. Very dry and musty with a slight hint of grassy sweetness. Its aroma reminds me of the time I walked into the hops “cellar” in Victory Brewing company… total hops immersion! If there is malt in the beer, than I am none the wiser. The honey is virtually undetectable. Lots of pine and citrus rind. ABSOLUTELY loving the way this beer smells … mmmm heaven. Flavor: Bam wam, thank you mam.Please sir, may I have another. PUNCH you in the face hops. I’m sorry Mr. Bell … but did you say that this ale has a 10% ABV. Well, heck if I can tell. This beer drinks as smooth, if not smoother, than mother’s milk. The honey comes out after a few sips … as the beer gets warmer the malt and sweetness is more apparent. But in the end, the hops dominate my tongue. Which is FINE BY ME. Mouthfeel: Beautifully smooth, super graceful. It is VERY RARE to find a 10% beer that drinks this well. In fact, it drinks almost too well. I could easily take down a 6 pack of this without blinking an eye … although, after taking down a 6 pack I might not be blinking my eyes too well … haha. Finish: AWESOME! Good job, Bell’s. Pairings: CHEESE! Esp the aged ones … blue would be beautiful! Comments: Since I am very familiar with Bell’s, I am confident in saying that this is one of the best batches of Hopslam that I have tasted. It is extremely similiar in profile to the Two-Hearted Ale, which is one of my all-time favorite beers EVER. I would really like to taste them side by side to confirm my conclusion. In my opinion, Hopslam is Two-Hearted taken to the next level. According to my roommate … the lovely Miss Candace “It smells like moldy clothes – like say you left my wet clothes in the dyer for 5 days. The taste is lingering bitter … even after a sip of water. Let me taste it … OH HELL NO! I feel like I just ate someone’s moldy clothes.” Well, once again … to each their own, right? On another note … the aroma of this beer is completely intoxicating. I suppose that hops is a very acquired taste, which is hard for me to understand since I love it so much. If I had my way, I would make a hops essence perfume and wear it all day. In fact, I wish there was a line of hops products … shampoos, conditioners, candles … soaps. Maybe my good friend Gwen, the brilliant founder and owner of BEYOND THE PICKET FENCE, will create a specialty soap using hops? MORAL OF THE STORY: Go grab as much of Bell’s Hopslam as you can … while it is still available! Its high alcohol level allows it to age fairly well … but, it is also very drinkable at this moment! CHEERS! The Brewers Association, a Boulder, CO. based industry group, defines craft breweries as: Those that brew with only barley malts as opposed to cheaper substitutes such as rice and corn. Those that produce fewer than two million barrels per year. Those that are independently owned, with no more than 25 percent ownership by a larger brewer or importer. According to the Brewers Association, craft brewery dollar sales have increased 58% since 2004, reaching $5.74 billion in sales last year. The Great Lakes Region – comprised of Wisconsin, Illinois, Michigan, Indiana and Ohio – saw a 28.1 percent increase in sales from $54.4 million in 2006 to $69.6 million in 2007. The Southeast Region – comprised of Mississippi, Alabama, Georgia, South Carolina and Florida – experienced the largest increase in sales, up 31.6 percent to $41 million in 2007. However, craft beers still only account for a small segment of the overall beer category – about 4% of production and 6% of retail sales. 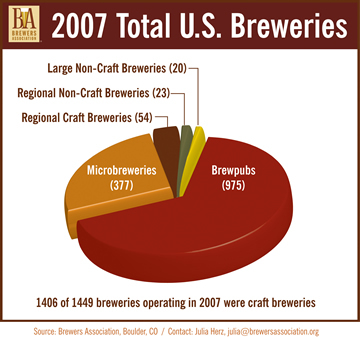 Nearly 70% of craft breweries, defined by the Brewers Association as an independent brewer selling fewer than 2 million barrels and having at least 50% of its volume sold in malt beers, sell most or all of their beer on site. With the craft beer segment growing as quickly as it has, some of the larger breweries are taking even more notice–either by acquiring smaller brands or creating their own small batch brands. Craft brewers are starting to face higher commodity costs for ingredients such as hops and barley. The cost of barley, wheat and packaging materials has all gone up in the past year due to crop disease, drought and demand for alternative fuel ethanol which has enticed farmers to plant more acres of corn and less of everything else. In addition, hops is in short supply due to a drought. Lucky for craft brewers, there are die-hards like me, ready to support them 100%. And by support, I mean buy and drink craft brews! Next time you drink beer, make it a craft.